As a massive bonus, this one is actually finished (and only took me one and a half days – who woulda thunk it?) so I can share the full before and after. It seemed like a nice little way to thank all you guys for being so, so, sooooo patient with me. 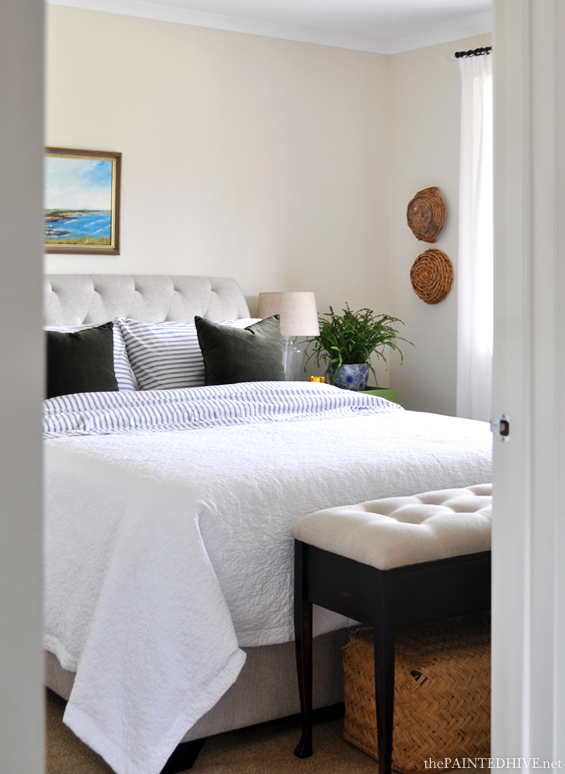 Although this bedroom transformation took place just last week, the wheels were set in motion a month or so back when I was asked to take part in and style a video tutorial for one of my favourite brands (I’ll share more on that when I can). As part of the styling, I needed to borrow a queen sized bed on mega short notice. 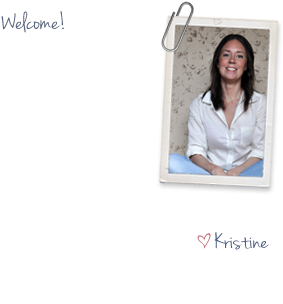 So, after I had a little freak out, I turned to Super Amart – a brand I’ve worked with in the past – who totally came to my rescue. Not only could they lend me the perfect bed, they actually decided to gift it to me! Needless to say I was blown away and incredibly grateful. Only thing was, I didn’t really feel I needed a new bed. Good thing I knew someone else who did! So sorry for the terrible before shots. Mum had to take them on her crappy old phone a few weeks back before she and dad moved the new bed into place. 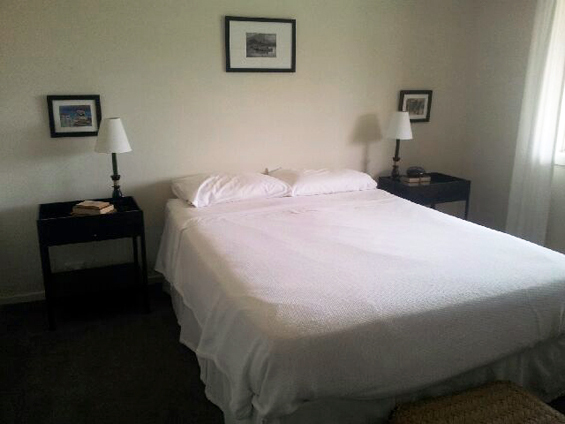 This is (well, was) the master bedroom at my parent’s beach house – located in St Leonards, Victoria. It’s a relatively new builder-grade home, so it does lack a little character, though its clean lines provide a nice, neutral canvas for crafting rooms around. 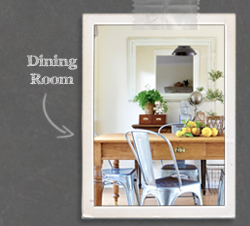 Our plan here was simple…use predominately what we already had to inject some vibrancy and a subtle coastal feel. 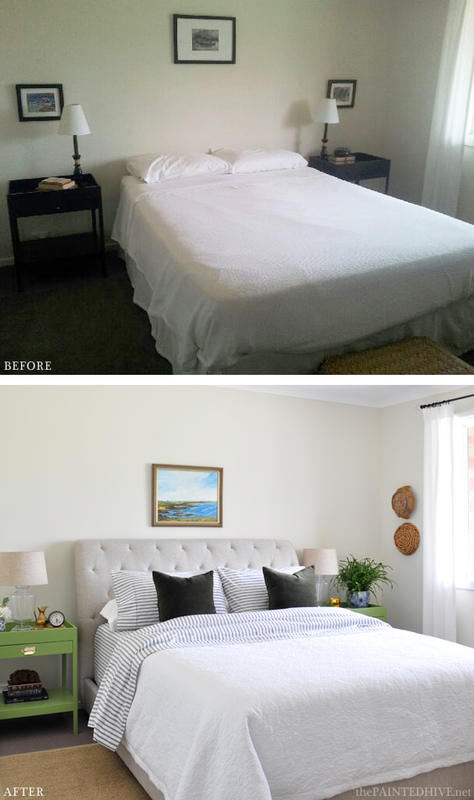 We didn’t paint the walls, we didn’t change the light fixture, we didn’t switch out the curtains, replace the flooring or bring in new bedside tables. 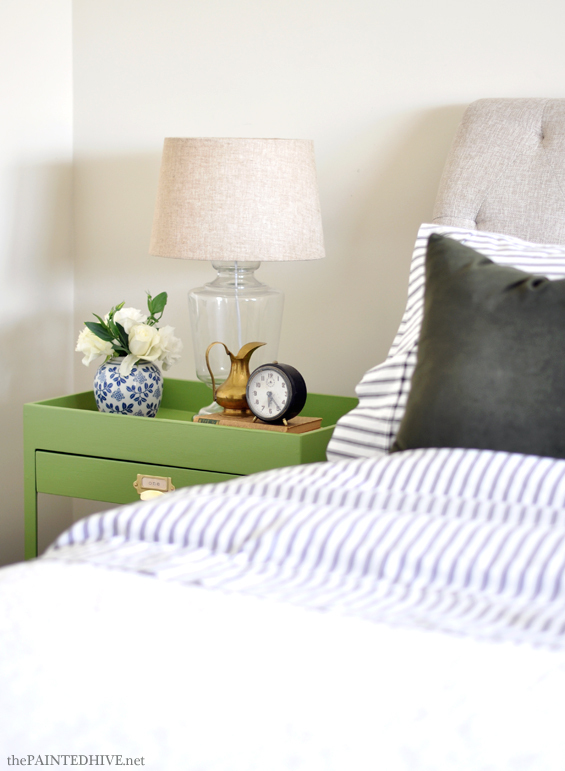 What we did do – new bed aside – was bring in some simple decorative accents and a fresh pop of colour. 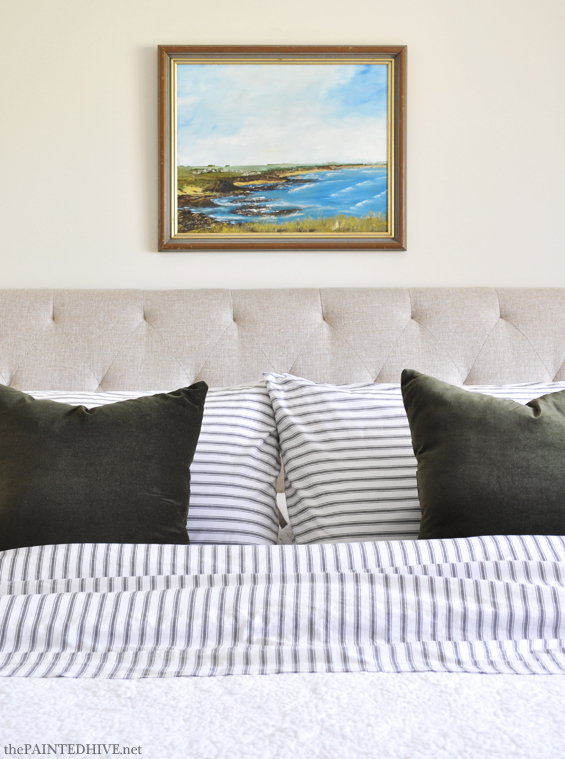 Naturally, the new bed from Super Amart (a great buy at just $450) is the centerpiece of the space, however its restrained grandeur means it doesn’t overpower the modestly-sized room or steal the show entirely. If anything, it’s more like a gentle hush. 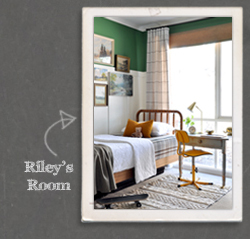 A beautiful back-drop to balance, compliment and quiet the lively blues and greens. 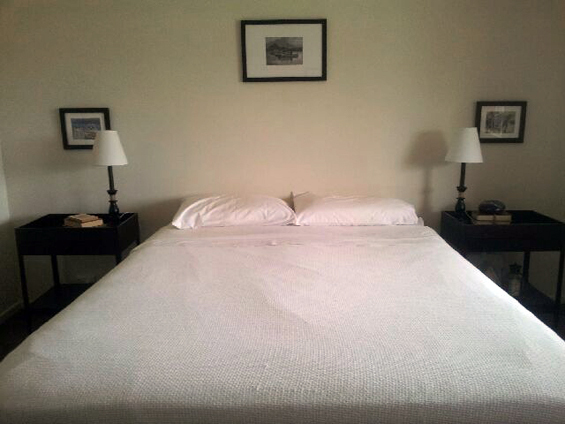 To keep things classic we went with simple bedding. 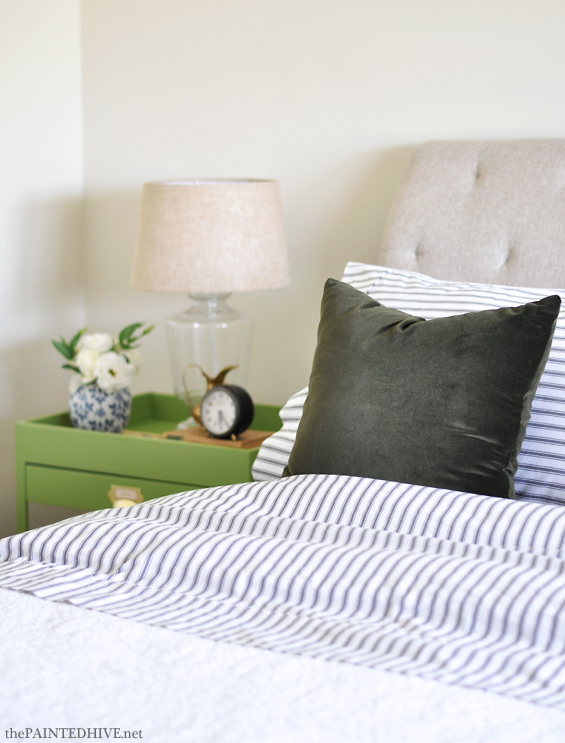 A white quilted doona cover which mum already had (originally from the Bed, Bath ‘n’ Table clearance store), some gorgeous deep green velvet cushions which mum made herself from inexpensive fabric she found at Spotlight, and my absolute fave – charcoal ticking sheets. What is it about ticking? To me those gentle stripes are the epitome of timeless, casual elegance. 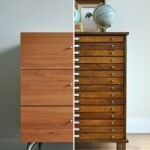 Those of you who are familiar with my blog and home will know of my love for ticking. Sadly, my ticking sheets went to heaven a month or so back after my super helpful husband put a massive tear in the fitted sheet whilst trying to stretch it over our mattress! I knew they were due for replacement, though still, I just about cried. After searching for a comparable replacement for ages (it seems charcoal ticking sheets are rather rare here in Oz) I eventually came across some at Taylor Road – a New Zealand based homewares store. Although a bit of a splurge for me, they are gorgeous and totally worth it. 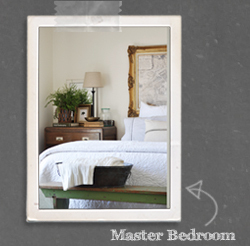 So, whilst these sheets are technically mine, I couldn’t resist using them in this makeover. And they are just so perfect I think another set might be on the cards! 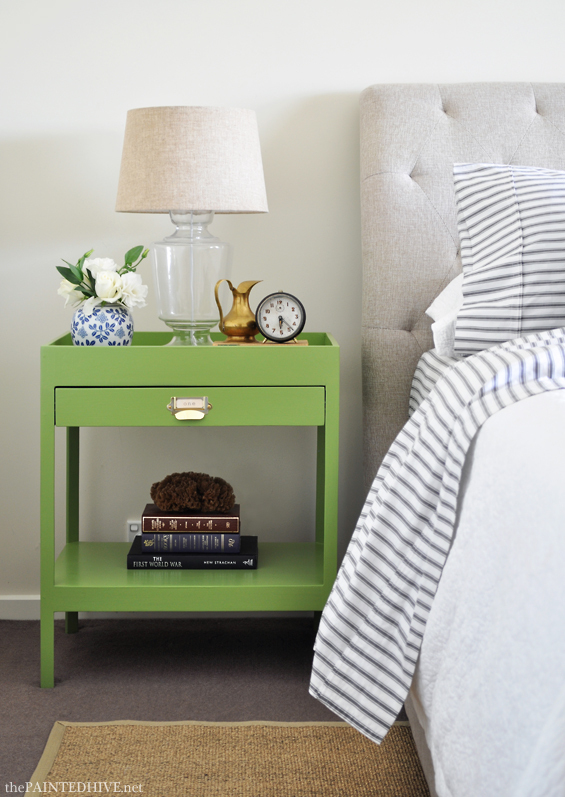 We knew we wanted to lighten-up the dark bedside tables (originally found on eBay for around $30 each) though couldn’t decide on a colour. Surprisingly, mum didn’t want blue (which was the obvious choice) due to a nearby bedroom already having blue accents. 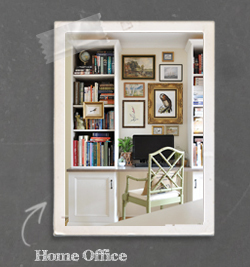 We threw around the idea of a neutral (white, taupe, cream, grey) though that felt a little safe. 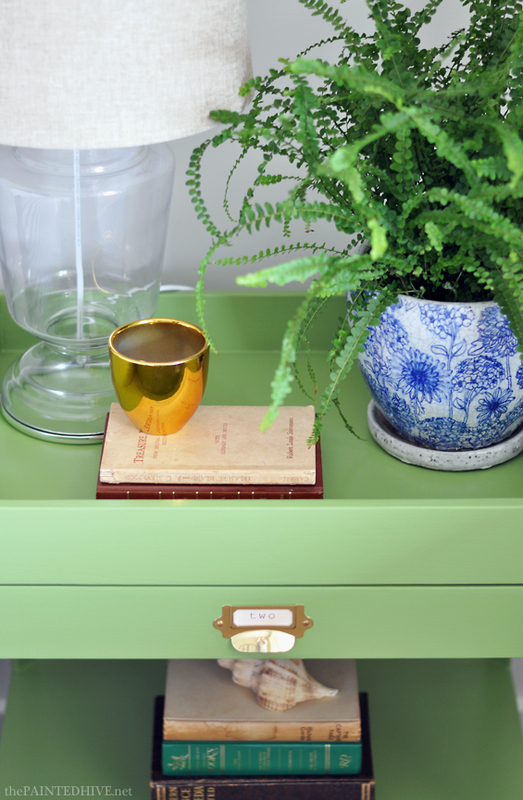 Eventually we decided on quite a zingy green (Dulux “Pretty Maiden”) to reference the green in the artwork. It’s actually quite refreshing having this unexpected colour. I think it takes away from any coastal cliche. 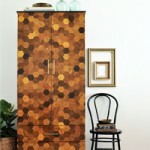 We also added new polished brass label pulls (from D Lawless Hardware) for a hint of glam. The rug is the Osted from Ikea. Mum bought it almost a year ago to use in her living room though then changed her mind. It’s been lying in her hallway (still packaged) ever since. 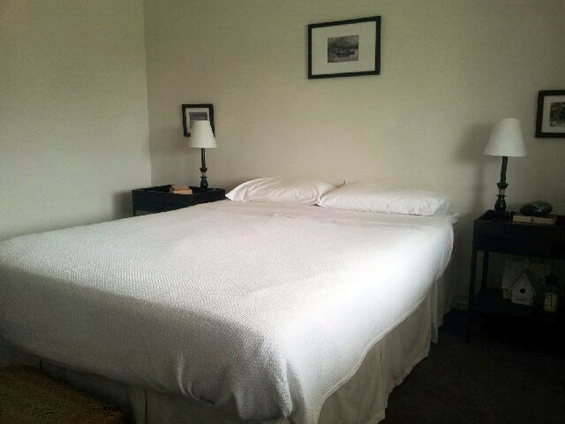 I wasn’t sure if its dimensions would work in the bedroom though we decided to try it out anyway. It’s perfect. I found the original artwork in an antique bazaar for just $25. The lovely thing about this piece is that it actually depicts a nearby beach (the location is handwritten on the rear). The gorgeous glass lamps are from Super Amart (you might recognise them from this previous post). I picked them up over a year ago for just $70 each though sadly they’re no longer available. That said, if you Google “verre table lamp” you might find them being sold elsewhere, albeit probably at a higher price. 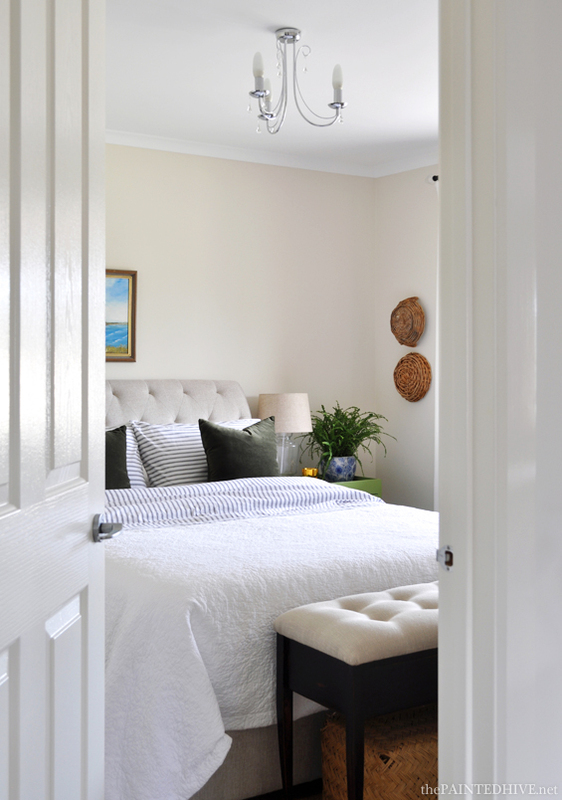 For use in this room we switched out the large drum shades for slightly smaller tapered ones from Freedom. I don’t know why, I just prefer a tapered shade. Mum already had the end of bed bench. It’s actually an antique piano stool from a secondary school. A year or so ago she replaced the wooden top (which wasn’t original) with an upholstered seat which just happens to co-ordinate with the new bed. I was a little concerned it might look too matchy-matchy, though there are subtle differences which actually help make it work. 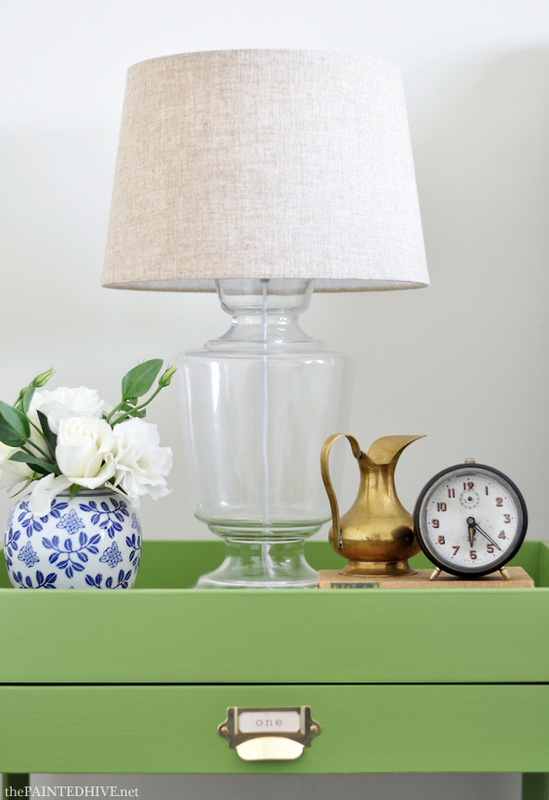 The wicker basket beneath the stool is an antique hope chest. It was passed down to mum from her great aunt. 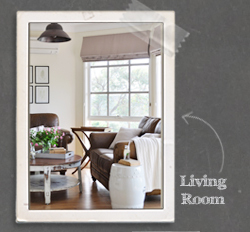 I love the way a dash of wicker injects instant cottage charm! To further the cottagey feel and provide a link I also hung some simple cane baskets on the blank wall beside the window. All of the decorative accents we already had. Most of them are from charity stores or antique bazaars. The shell and sea sponge are from the beach (duh!) and the lovely plant is a Lemon Button Fern (Nephrolepis). Never had one before though apparently they’re excellent indoor plants and very hardy – we’ll see. 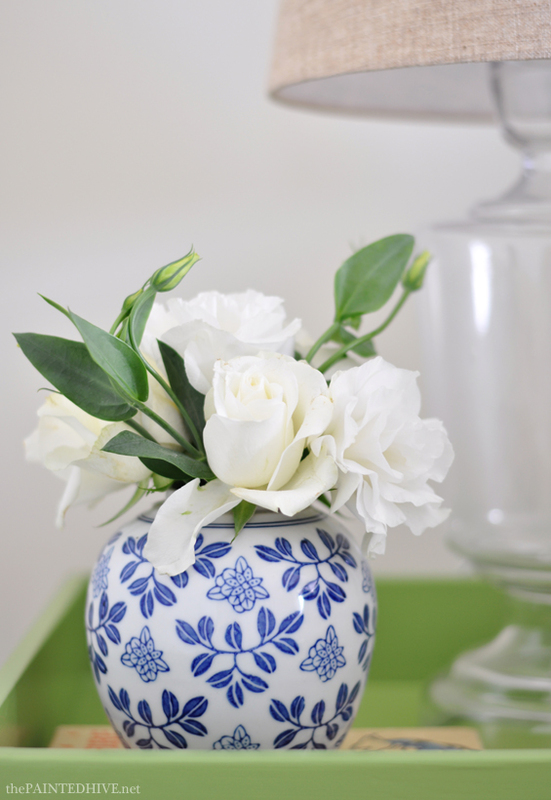 Some simple white blooms compliment the scheme beautifully. Sorry I didn’t get many “full” room shots. It’s a reasonably small space so was hard to capture without using a wide angle lens (and I’m not a huge fan of using wide angle lenses because they tend to bend the image, throwing off proportion and creating distortion which isn’t great for interior shots). 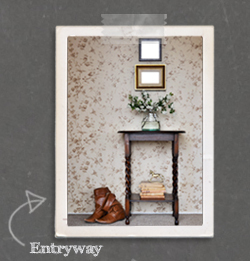 Did you notice the stool and wicker chest are missing from the above shot? Oops, I forgot to put them in place for some of my pics. All-in-all it was a busy, yet fun, day and a half of decorating! Beautiful Kristine…so clean and sharp looking!! Just gorgeous and thrifty as always. It’s really stunning. 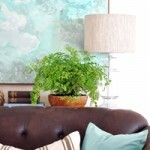 I love love love that green color and agree it’s a nice departure from the regular coastal colors. Impeccable styling. 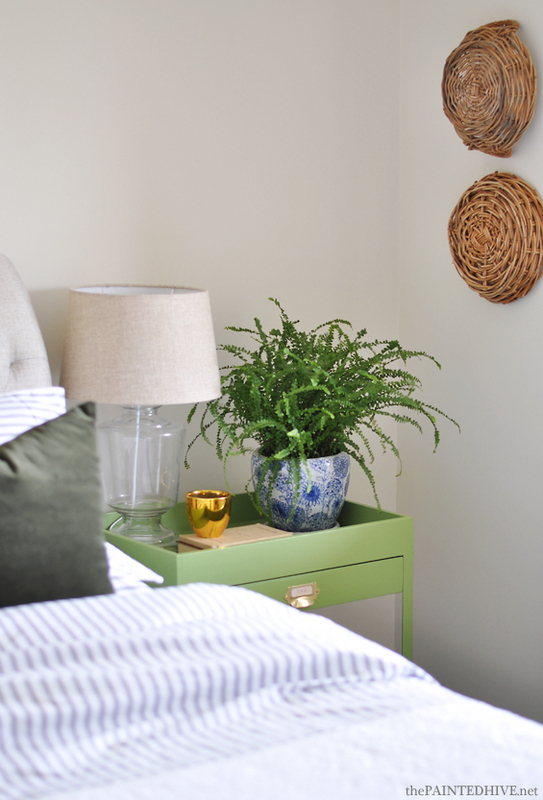 I love that green and I got those table lamps the day you told us about them. Just wish I’d bought two now :( Thanks for the tip about Taylor Road. Really hard to find understated but classy bed linen these days. Thanks Jo. Taylor Road has some gorgeous stuff. Not one of my usual bargain basement recommendations, though great for spoiling yourself a little. 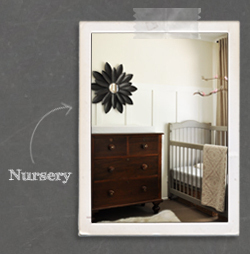 For such a quick makeover, it sure turned out lovely! I love the new bed, and ticking steals my heart every time. 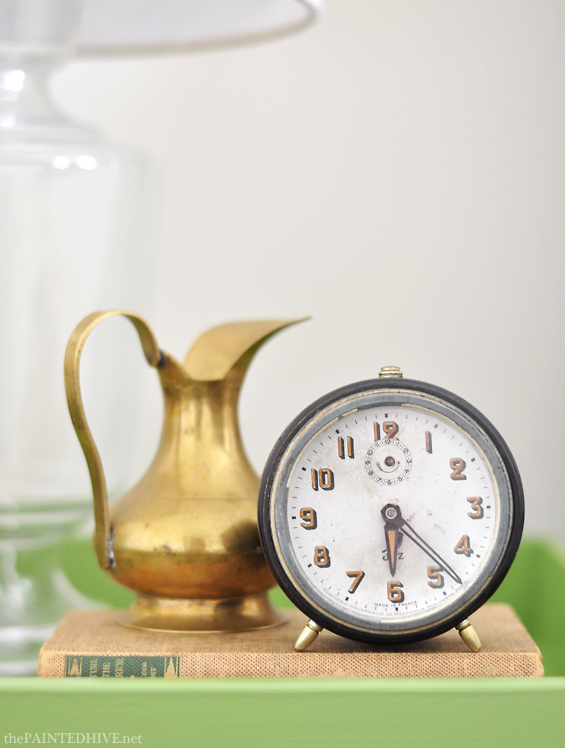 Thanks for sharing it at Talk of the Town – I pinned it to the Knick of Time party board! So finished and inviting!! 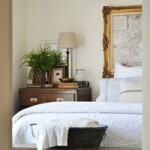 love the headboard and bedding. 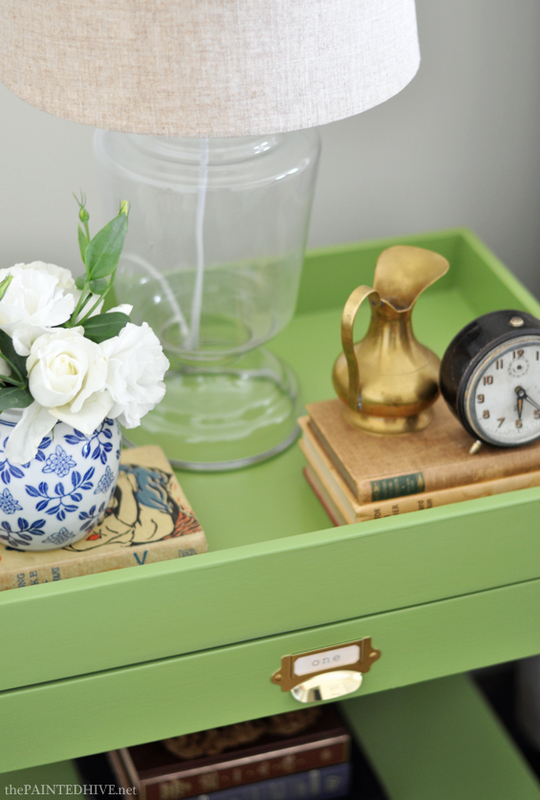 The green bed side table is so cute. 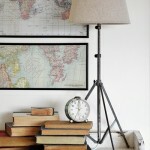 It’s a perfect piece for bedroom makeover. Just love this gorgeous transformation. Great job Kristine! It is so cute–bright and fresh! Thanks for linking up to Talk of the Town! Seriously, lovely makeover! I love how calm and collected yet how layered it looks. Great job. Thanks for linking this up at the Creative Gallery! I absolutely love the striped sheets and pillowcases! It gives it such a crisp, clean look. The bedroom looks perfect! Thanks so much Vineta. They are my all time favourite sheets – so timeless. What a difference the colour makes! I need to redo my beach house and now I am convinced it should not cost an arm and a leg! 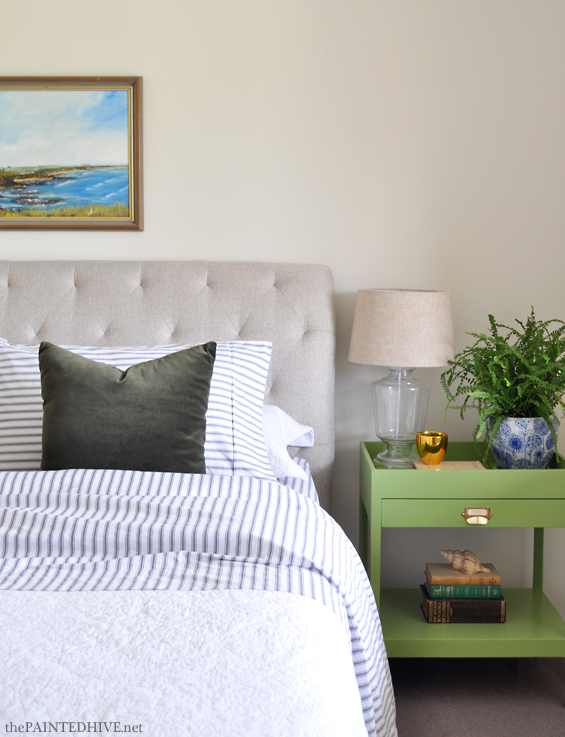 This is such a breezy, bright, coastal space. 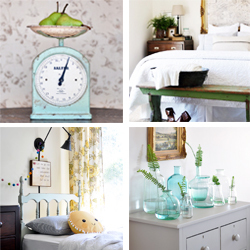 I too adore ticking, those sheets are wonderful… love the pop of green on the side tables too! Oh yes, I know of your love for ticking too. It’s the BEST!!! Love how it looks now, it doesn’t seem the same room. The new bed gives a lot of character to the room. 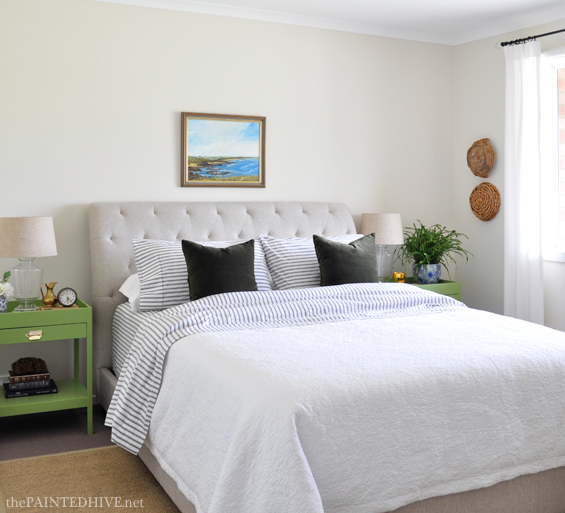 thanks for sharing this coastal bedroom makeover at dream create and inspire, i am in the middle of a one room challenge and I am doing a guest bedroom. Love the green and blue colors, very inspiring. 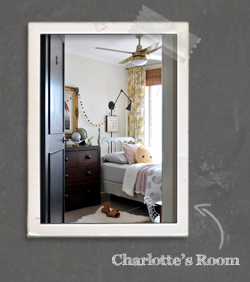 If you have a few minutes stop by and see the one room challenge, its 6 weeks and I am on the second week. 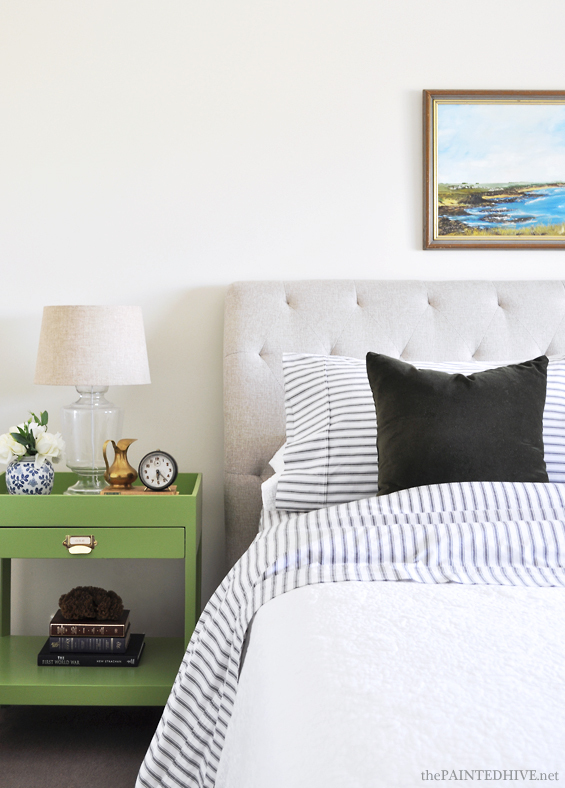 I LOVE the green nightstands and the mattress ticking sheets! You brought this room together beautifully, and in a day and a half?? Impressive!! Thanks so much Jenny. Yep, a day and a half – that’s a sure record for me (I’m normally sooooo slow)! Beautiful! Thanks for sharing at HSH! 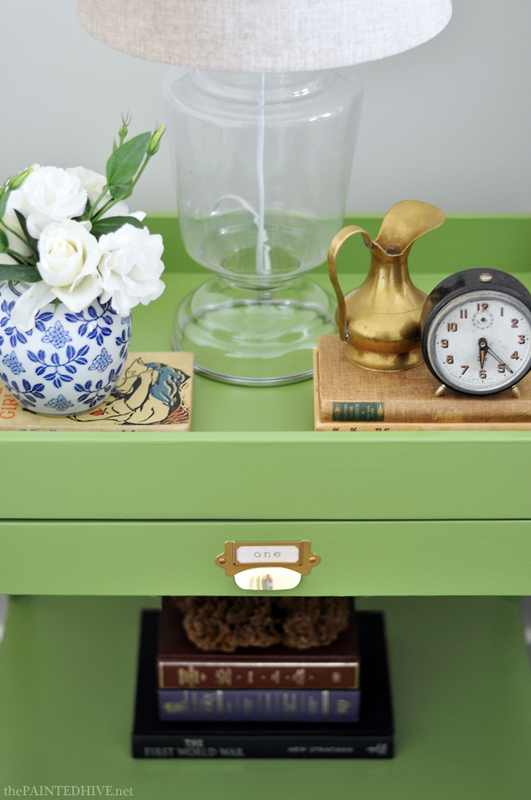 Amazing how much adding 2 night stands with color can affect the tone of a room. Stay true to keeping it simple, looks gorgeous! Thanks for the inspiration! You were perfectly right in choosing the simple bedding for this one. Everything in your new room look perfect. 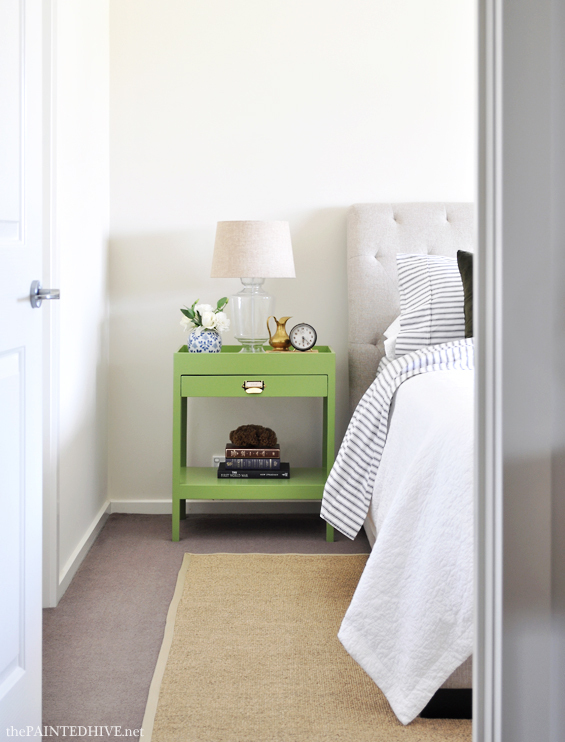 The shade of two tables gave a little touch with this bedroom. Great work for the make over. Looks so beautiful,choosing a perfect colour for bedroom is a great work u done with it.I appreciate ur way of design.Thanks for your beautiful designs sharing.